After having so much fun swimming with sharks in Bora-Bora, my wife and I decided to try another local sea-life adventure; Swimming with sting rays. 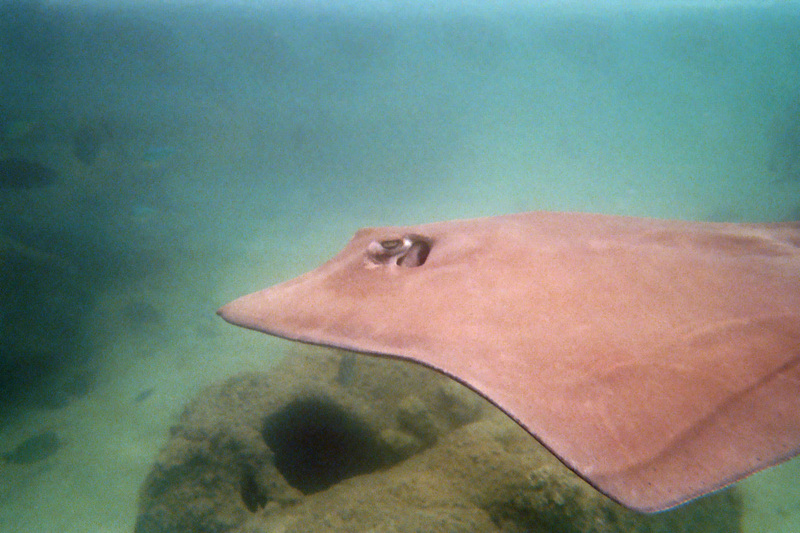 For those of you familiar with the small rays and skates common along many shore lines, these are not those kinds of rays. These are monsters, often exceeding 4 ft (1.2 m) in width. And they really are a lot of fun. We were staying in an overwater bungalow at Sofitel Marara, which is an amazing place. 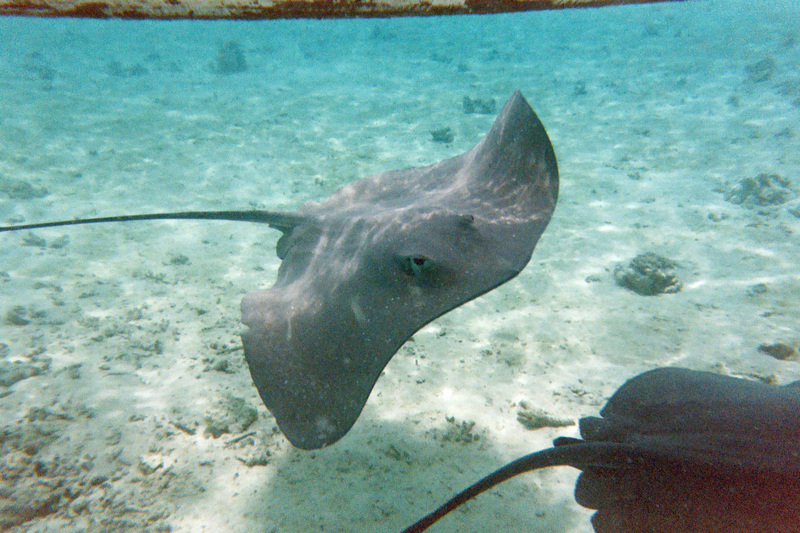 Every morning there was a local ray that would come by for a visit, and to see what was being offered for breakfast. My wife quickly learned that he really liked smoked salmon, and I had to fight to protect my breakfast treat every day after that. She got to like this ray so much that she even gave him a name; Charles. 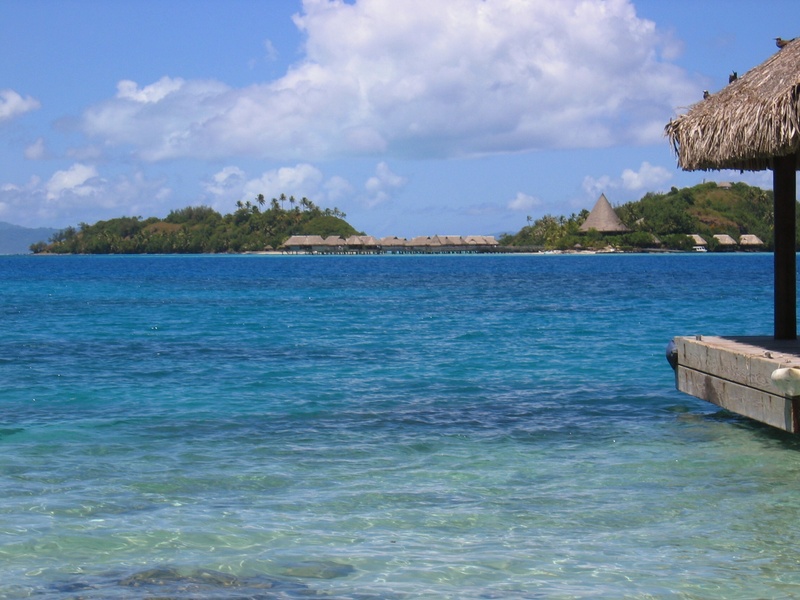 We joined another American couple for a half day trip out into the lagoon that surrounds the main island of Bora-Bora, going to a (secret) place where the guide brings guests for this experience. Several times during the trip he told us that these rays only come to this particular spot at one time of day, and if we come back on our own, they won’t be there. Did we believe him? Umm, no, not really. But not that it mattered since we were not likely to rent a boat and go back for ourselves anyways. So we get to the place, and jump into reasonably shallow water, about chest deep for me and neck high for everyone else. 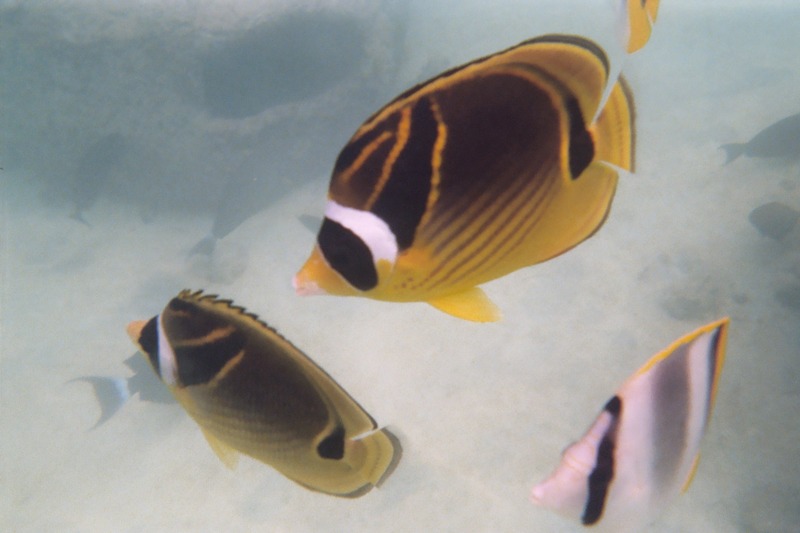 And at first we found nothing but really cute, curious, and I suspect ‘hungry’, small reef fish. 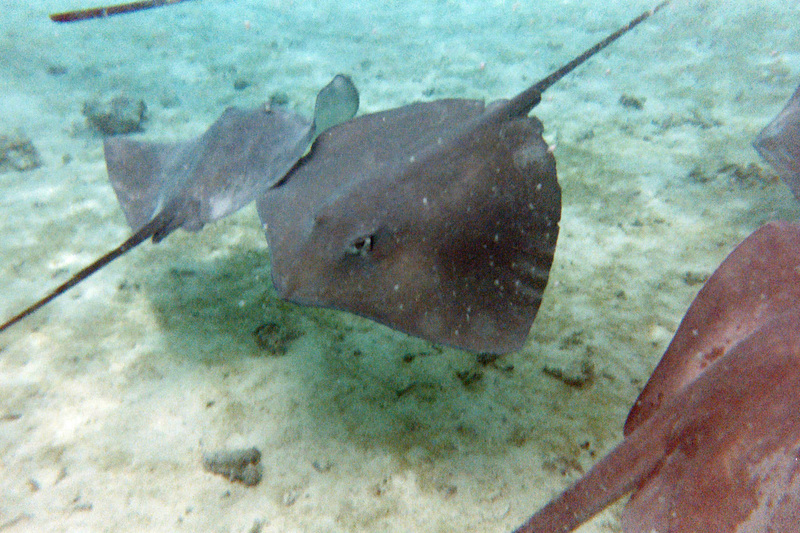 But within a few minutes we were surrounded by these really friendly and inquisitive rays. And man, they are BIG! My arms stretched out full width were about as wide as some of the largest ones. And they are so gentle too. They come right up on your chest (if you let them) and basically hug you with their wings while their mouths are searching for the food that they hope you have for them. The best description of the day was made by the other woman who was with us. When the first of these rays showed up, she pointed at one in the water and said it looked like a giant swimming portabello mushroom. You know, I think she’s right! That’s a great description. Our guide had several buckets with pieces of fish that he used to attract and then hand feed the rays. After feeding a few, he asked would anyone want to try… Yup, I moved right over to him and he handed me a piece. His instructions were to wedge the bait between two of my fingers, laying it flat in my palm. 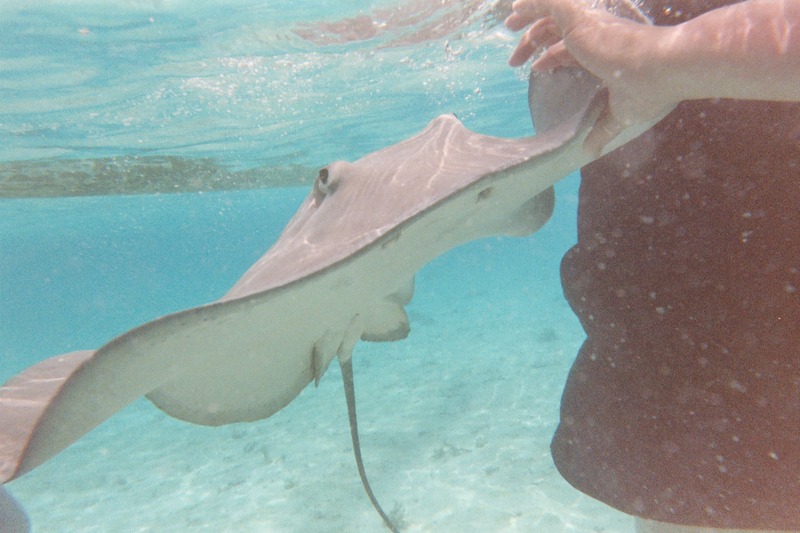 The ray would then slide up my hand until its mouth reached the bait. Then “Whoosh” a sucking feeling like a vacuum, and the bait was gone. Loved it! After I fed a few rays, I convinced my wife to come over and give it a try. She was a bit nervous to start with, and kept dropping the bait when the rays first touched her. 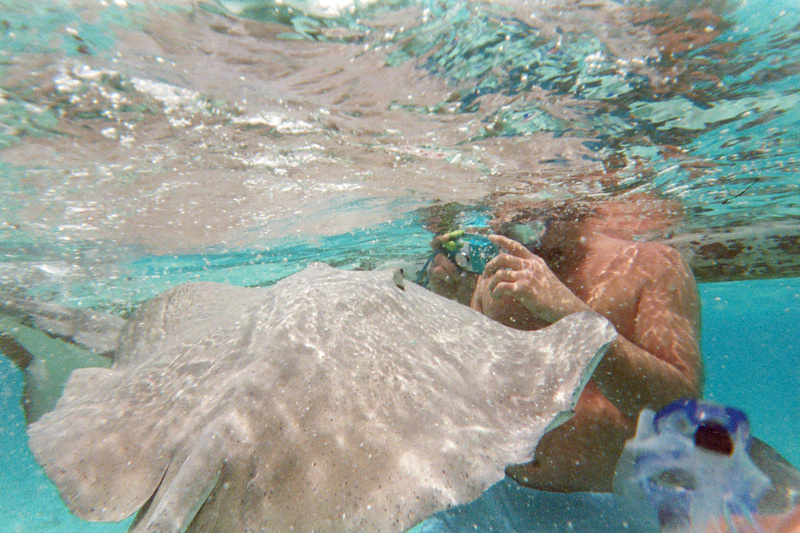 But by the 3rd or 4th time she had the knack and was hand feeding the rays like a pro. After maybe 20 minutes, the guide suddenly told us to get out the water and up into the boat. He didn’t explain why, we were all having fun, but he was very abrupt about it. He definitely rushed us out of the water and back into the boat. Turns out he was keeping an eye on something else. A shark had shown up, attracted by the food and the splashing. And this was not one of the fairly docile black tips we had swum with the day before. This was an adult Grey Reef shark, and it is not the type of shark you want to have a casual encounter with when there is food in the water. As we sat in the boat and watched, this shark circled all around the boat and the area where we had just been feeding the rays. The rays, like us, had also made themselves scarce and were nowhere to be seen anymore. 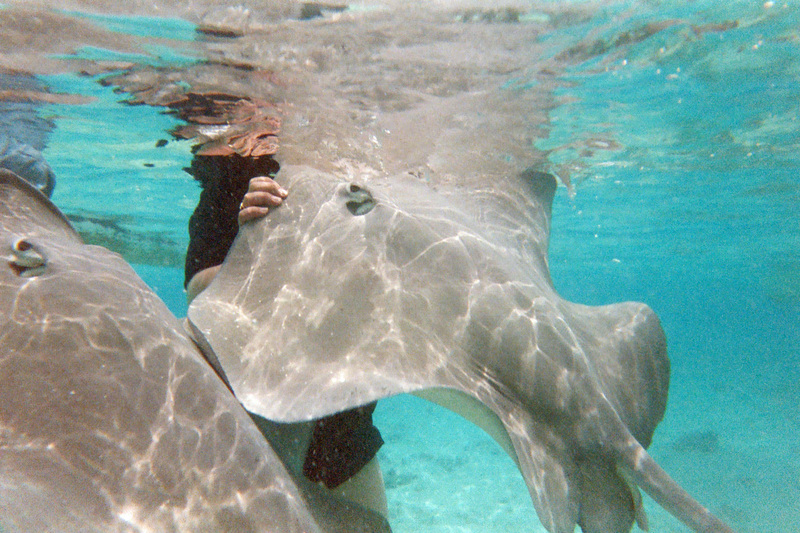 The guide said “C’est fini” (all done) there would be no more swimming with the rays. But to keep us entertained, he motored us about a mile away to another spot where there were these swarms of small to medium sized fish. We got in the water with them, and he passed out the remaining bait and we had a great time hand feeding all these fish. I’m sure you have worries about swimming with sting rays, and the sad fate of Steve Irwin certainly comes to mind. But there was never any feeling or sense of danger at all in being with these really magnificent creatures. Of course, the reaction might be different if you were wading in shallow water and stepped on one. 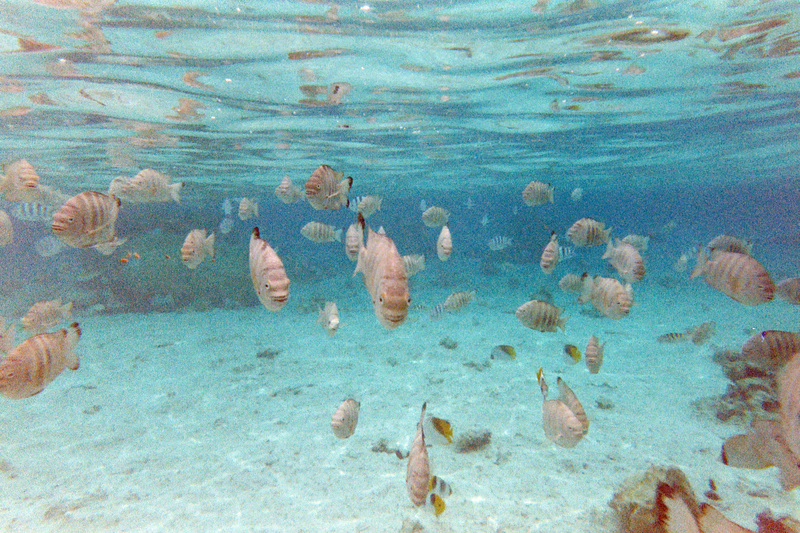 But out in the deeper water, they flew like “animated mushrooms”, and we just had a great time with them. And no, they are not slimy or gross feeling at all. About the closest description I can give would be touching a warm piece of rubber, or the neoprene suits worn by divers. Really a wonderful and memorable experience. Give it a try! This seriously is the coolest thing ever! Bora Bora is so on our bucket list and we would love to swim with the rays! So Cool thank you for sharing! They look so gentle Awesome! How incredible!I would love to do this one day and to visit Bora Bora – so far from London but so beautiful! I love this post! 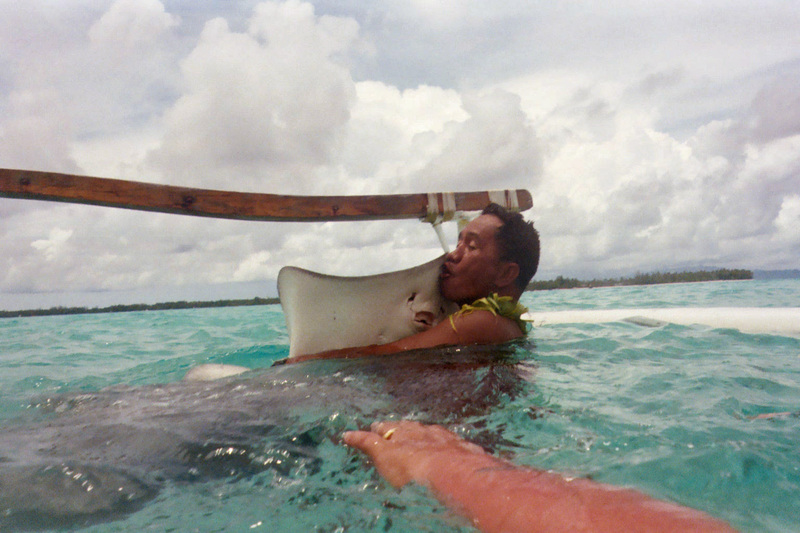 Big hugs to the rays! 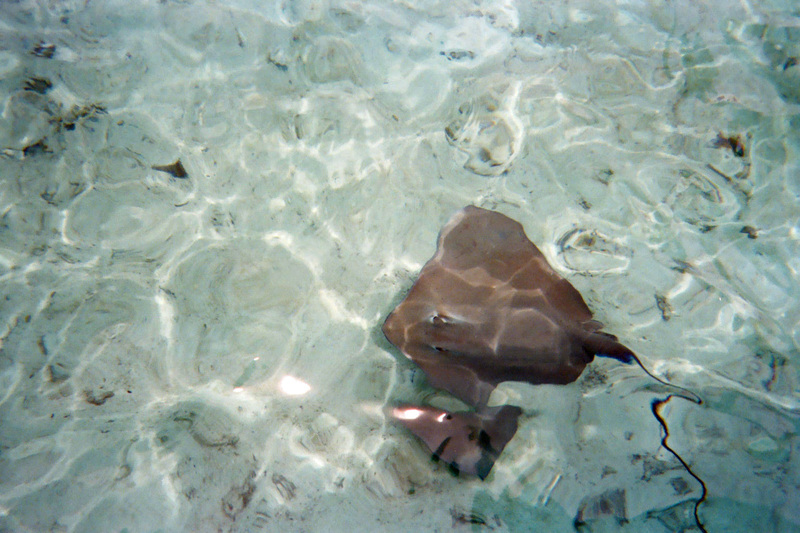 This entry was posted on February 24, 2014 by jlroehr in BoraBora and tagged Bora-Bora, BoraBora, French Polynesia, Sofitel Marara, Sting Rays, swimming with rays.